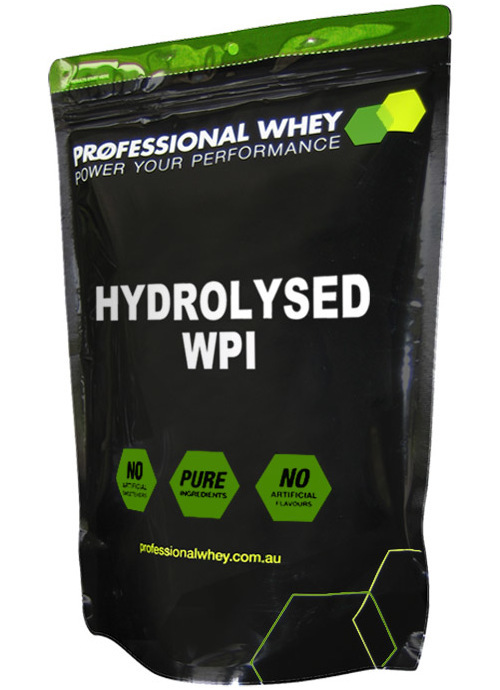 Made in NZ, our Hydrolysed WPI is one of the most advanced whey proteins to assist with gaining lean muscle and/or increasing recovery. Reason being, the proteins are broken into smaller protein chains so they are absorbed much quicker by the body. With a degree of hydrolysis of 20.7% and a low average molecular weight of 1400 Daltons, it has very high levels of Di & Tri Peptides which assist with rapid absorption, enabling a quick increase in protein synthesis making it ideal to consume around your workout. This makes it significantly superior to Whey Protein Isolate and Concentrates but there is evidence that shows Hydrolysed Casein to be a superior choice over Hydrolysed WPI when it comes to muscle gain and fat loss. However we recommend Hydrolysed Casein and Hydrolysed WPI being used together to get the synergstic benefits of whey peptides and casein peptides. Available in 1kg packs with bulk buy discounts on offer. Note: Hydrolysed WPI has a very bitter taste, due to its hydrolysis. Organic Stevia Extract and Dextrose do mask most of the bitterness. Also the hydrolysis creates a very microscopic fine powder which will froth when shaken, so please gently stir if you want to avoid the frothiness. Mix 30g (one level scoop) into 250ml of water until dissolved in a shaker. This product is all natural with no additives and as such is the best supplement for anyone sensitive to lecithins and numerous other additives found in most HWPIs. Additionally, it is fast acting, doesn't leave you feeling bloated and is best value for money. I find it helpful to mix this with natural Rice and Pea proteins to reduce frothiness; stavia for taste and finally Psyllium husk for fibre. I have used a number of protein products over the years and this is by far the best for results. The high quality fast absorbing protein has allowed for better recoveries. It has an awful bitter taste. I usually counteract this by including some flavored whey isolate. As per price, this is the cheapest, highest quality Hydolysed protein I can find. Well worth the money. I tried this out and am very satisfied with the results. Good diet is one of the keys of success - plug this into your diet and you are set up for success. Add the excellent customer service of Professional Whey into the equation and you can't go wrong. I mix this with the Hydrolysed Casein and a spoon of milo. tastes fine and gets fast results. Definitely brilliant products. GREAT PRODUCT DESPITE THE TASTE !!! Very good quality product, fast results to boot too ... the taste takes a little getting used too but then again the worse it takes the more natural it is !!! Some products might taste better, but if you want to do the best for your body you need the purest best Protein you can get. Don't put sweeteners and other junk into your body. This is the one you want. Excellent price as well and service is always the best. 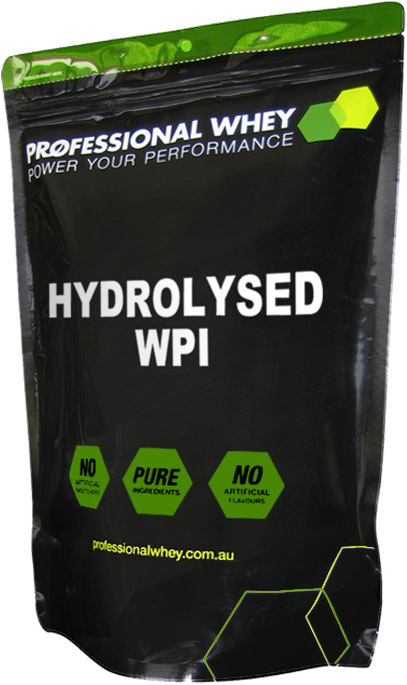 I started using the Hydrolysed WPI about 3 weeks ago and found instantly I was recovering faster. The taste isn't great, but I found I got used to that. This is a great product that is a fresh change to the overpriced protein powders found in supplement stores with a million ingredients. You know exactly what you are injesting and no concerns about artificial flavouring, etc. Tip - was shaker immediately and if left in sun for just half a day it becomes a chemical biohazard! I KNOW, crazy. But true. I've been on this for a couple of months now, and when I first tried it I concluded that it was the most disgusting tasting thing I had ever put in my mouth. Doesn't mix well, had to combine it with copious amounts of cinnamon and stevia to mask the horror that was assaulting my taste buds. However, over time... it grew on me. And now I simply whisk it with water- no need to hold my nose anymore. So it IS POSSIBLE! I gain quicker with this product. Bring on the bulk orders!! Doesn't have to taste disgusting! I started using this on its own (with water) and with dextrose. Either way it tasted bad! But then I tried adding stevia extact (1/8 tsp) and cacao (1/2 tsp) to just the WPI (without dexterose) - it actually tasted great! Really great! Don't torture yourself - get the stevia & cacao. Vanilla extract might be good too. Also I started trying to mix without a shaker (stiring with a fork) - okay (but lumpy) if you gradually add water to make a paste. But much better if you buy PW shaker - quick and easy mix (with very slight lumps). Ben's comment is spot on! A high quality product but the taste makes me literally gag. I'm wondering if there is ANYTHING that can make it taste even a fraction palatable. I use other protein products from professional whey so I think I may have to mix. Great results from it but damn it tastes bad. Is so offensive when mixed that needs a whole tablespoon of coffee powder to make it bearable. Will keep using though....no pain no gain! Obviously a very good quality WPI and hydrolised to a higher percentage than most other proteins I have encountered. Unfortunately though, unless mixed with something else the taste is unbearable! The warning of "a bitter taste" should read "taste like satans gym socks".